Musical Guest: Betsy Stewart and Friends play folk/Americana from 4-6 PM. Community Booth: Jaxon Morgan of Hartland Community Connections. He'll be selling raffle tickets for a go-kart! Come support HCC and the wonderful work they do in our community. Peas are here--I'm thinking this salad looks pretty good. Come pick up your provisions at the market. Don't forget we've got prepared foods, too, if you're too tired to cook! A quick note: We ask that you please leave your pets at home. Thanks! Musical guest this week: Adam McMahon. 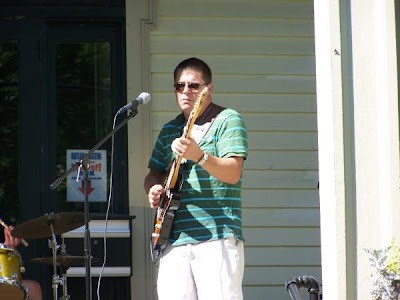 He'll be playing an eclectic mix of blues, rock, and modern folk. He'll be here from 4-6 PM. In the community booth this week: Hartland Jazz Fest. Stop by to learn more about this new music event taking place in Hartland this weekend. Produce you are likely to find this week: Beets, Chard, Herbs, Garlic Scapes, Greens, Arugula, Lettuce, Peas, Radishes, Rhubarb, Scallions, Sprouts, Strawberries, and Zucchini. Be sure to ask the farmers for their favorite ways to prepare whatever you buy! It's going to be another great Friday. Can't wait to see you all there! We've got an exciting market for you this week. Lisa Piccarillo and her band Hotels and Highways will be the musical guests from 4-6 PM. Michael Zerphy and Clowning Around will be in the Community Booth. Bring the kids! The weather is looking good this week so please stop by on Friday from 4-7 PM. Thanks to everyone who came out last week for our first market of the season. We appreciate your support! and perhaps a few surprises from the farmers in attendance. The Hartland Recreation Center will be at the Community Booth. Interested in their summer programs? Stop by and ask questions. Carlos Ocasio is our musical guest. He'll be performing from 4-6 PM. Should be a great day at the market! See you on Friday from 4-7 PM.